More places to buka puasa and this one is a really value-for-money treat! 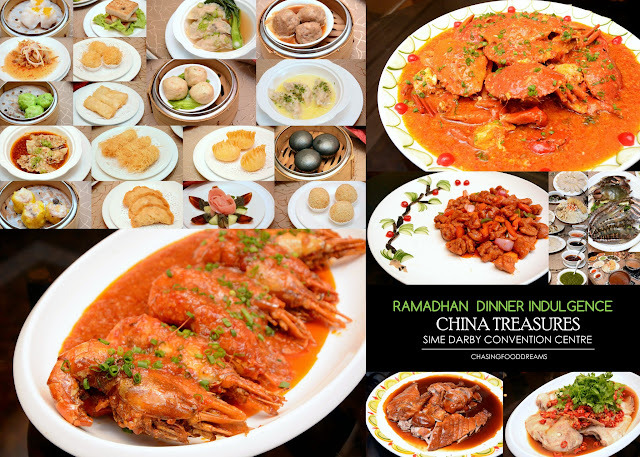 China Treasures of Sime Darby Convention Centre (SDCC) is offering a sumptuous buka puasa promotion aptly named Dinner Indulgence. It is indeed a lavish treat as the buffet offers diners the best treasures the restaurant has to offer from 60 all-you-can-eat a la minute dishes, 69 delectable dim sum and 22 hot pot steamboat items. 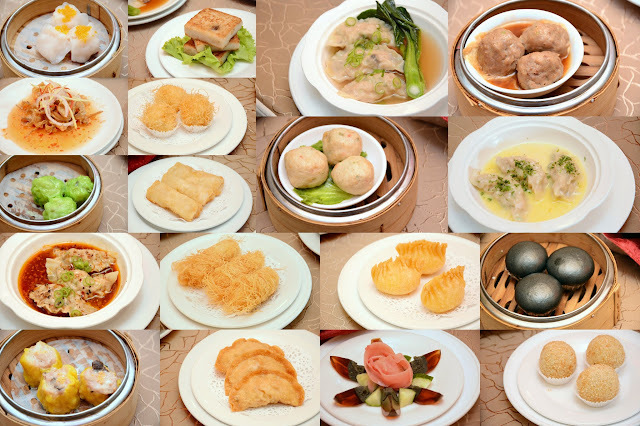 It is indeed mind-boggling in choices and even the dim sum choices alone are huge! It is my first time visiting China Treasures and the fine dining Chinese restaurant is beautifully decorated in Oriental grandeur. There are private rooms for dining as well as the main dining hall which is spacious and plush in design. First up, with 69 varieties of Dim Sum, this is alone a treat. 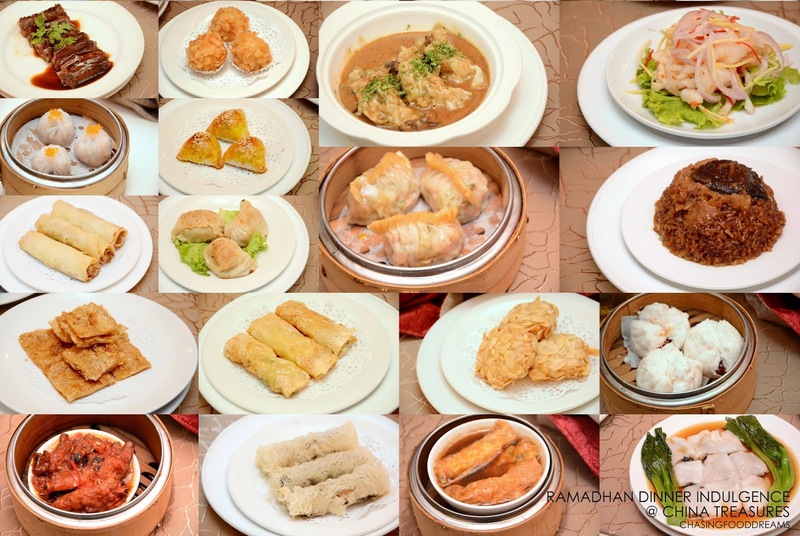 From the Steamed Dim Sum to the Deep-Fried Dim Sum and other small Dim Sum dishes, it is a plethora of well-made Halal dim sum. The Steamed Dim Sum was plump and decent in sizes while the flavours and textures is quite excellence for Halal Dim Sum. To name a few of the choices available, there are Steamed Chicken & Shrimp Dumpling with Dried Scallop & Cilantro, Steamed Chicken Dumpling with Sweet Corn, Steamed Crystal Shrimp Dumpling, Steamed Crystal Shrimp & Scallop Dumpling, Steamed Rice Roll with Shrimp, Steamed Beef Ball & Beancurd Skin, Steamed Szechuan Hot & Spicy Chicken Dumpling, Steamed Squid Ball, Steamed China Treasures Glutinous Rice, Steamed Chicken Feet with Black Bean Sauce, Steamed BBQ Honey Chicken Bun, Steamed Butter & Salted Egg Yolk Bamboo Charcoal Bun, Deep Fried Prawn & Mango Roll, Deep Fried Shrimp & Fish Paste Cheese Ball, Deep Fried Yam Puff, Stir Fried Radish Cake with Dried Scallop, Baked China Treasures Mini Egg Tart, Baked BBQ Honey Chicken Puff and more. Moving on to the Hot Pot Steamboat, there is a choice of Clear Chicken Broth or Tom Yam Soup for the hot pot. 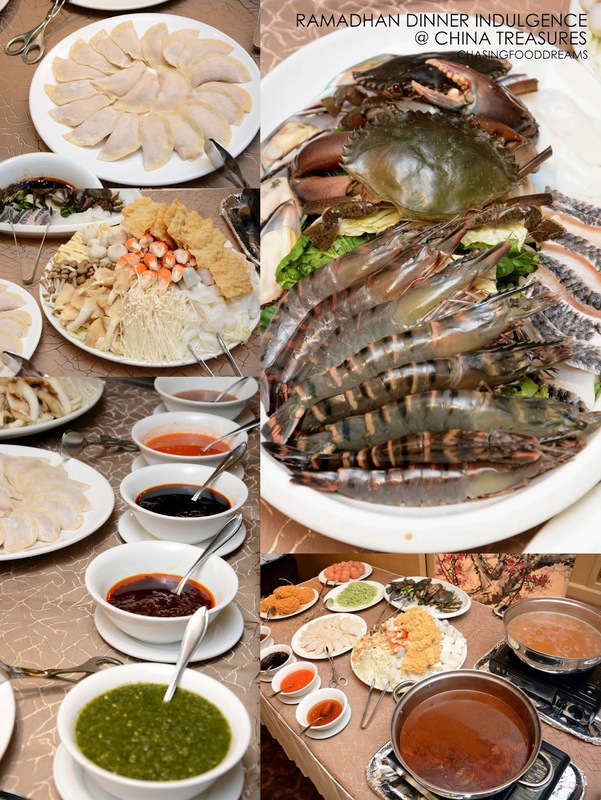 Then one can simply choose from the various ingredients such as Sliced Fish Fillet, Tiger Prawns, Mud Crab, Green Mussel, Cuttlefish, Fish Ball, Crab Claw Ball, Salmon Beancurd, Sui Kow Dumpling together with a variety of vegetables, mushrooms, noodles and egg. The Sui Kow Dumpling is excellent! Heading towards the main Chinese dishes, there are selections of Soup, Appetizer, Seafood, Meat & Poultry, Beancurd, Vegetables and even Vegetarian dishes plus Dessert. Szechuan Hot & Sour Soup is deliciously sour and piquant with lots of finely shredded ingredients in the thick broth. The appetizer of Deep Fried Shimeiji Mushroom with Salted Egg Yolk is also yummy with its crispy mushrooms coated in the unctuous and sinful salted egg yolk sauce. From the fish section, we had the Steamed Tilapia Fish Shanghai Style and Steamed Tilapia Fish with Minced Chili Soya Sauce, I love the Steamed Tilapia Fish Shanghai Style for its spicy and robust flavours balanced by the sweet smooth flesh of the fish. We also had lots of prawns that evening. Choosing the various choices is indeed difficult as both Steamed Tiger Prawns with Egg White and Baked Tiger Prawns with Salt & Pepper is equally good. Both prawns were fresh, juicy and sweet. I am glad we chose the classic choices as they are these testament to the chef’s skill in cooking these crustacean right. We had Braised Soya Sauce Chicken and Sweet & Sour Chicken. Although both are good, the Sweet & Sour Chicken won by a little with its crispy chicken pieces coated in a lovely sweet and sour sauce. I must say that platting was indeed elegant and lovely. Roasted Duck Pi Pa Style won votes from everyone for its flavour and texture of the duck. We also had a beef dish of Black Pepper Beef. It’s decent and there is also venison for those who are more adventurous. We savored Stir Fried HK Mini Kai Lan with White sauce and Stir Fried French Bean Szechuan Style. There are more vegetable and beancurd dishes too. For Dessert, we had their Steamed Salted Egg Yolk Custard Bun and Chilled Snow Skin Dessert. To seal off this great offer, guests of Dinner Indulgence are entitled to purchase Sime Darby Convention Centre’s Citarasa Ramadhan 1 Malaysia Buffet vouchers at only RM79 nett per person, instead of the full price of RM120 nett per person (T&C applies). Dim Sum Buffet is also available daily from 11.30pm to 2.30pm at RM69nett per person. Due to popular demand, the restaurant will be extending two additional dim sum buffet sessions on weekends and public holidays, priced at RM49nett per person from 10am to 11.30am and 3pm to 4.30pm. Special banqueting packages for Ramadhan Buka Puasa, Hari Raya Open House and Outside Catering services are also available. Book early to avoid disappointment.